STURGEON BAY, Wis. (March 1, 2019) — Big Brothers Big Sisters of Northeast Wisconsin invites the community to participate in Bowl For Kids’ Sake, the agency’s signature fundraiser combining bowling and team spirit with a pledge drive to support youth mentoring in Door County, on Saturday, March 9, at Apple Valley Lanes. 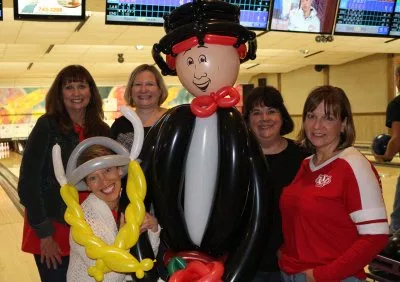 Teams of supporters helped raise more than $26,000 in net revenue last year for Big Brothers Big Sisters of Door County at Bowl For Kids’ Sake. This year’s event is Saturday, March 9. Teams can register at bbbsnew.org. Follow the event on Facebook at facebook.com/bbbsdoorcounty. The event is made possible by the Green Bay Packers, Tadych’s Econofoods, Nicolet National Bank, Door County Medical Center, Scaturo’s Baking Co. & Café, Denistry by Design, along with promotional support from Rewind 97.7 FM. More than 100 bowlers helped raise nearly $26,000 in net revenue last year. Bowlers will receive two free games of bowling 9 pin tap (ball and shoe rental included), food, a T-shirt and chances to win prizes and bucket raffles. Two shifts of teams will bowl at 3 and 6 p.m. Each bowler collects a minimum of $75 in pledges or a team of five collects a minimum of $375. Teams and individual bowlers are encouraged to register in advance, but can register at the event. About Big Brothers Big Sisters of Northeast Wisconsin:100 percent donor and volunteer supported nonprofit organization that provides children facing adversity with professionally supported, enduring one-to-one relationships that improve their lives for the better, forever.